International departure taxes of $164 plus current fuel surcharges of $300 are included (subject to change). Today, we depart Chicago to connect with our transatlantic overnight flight to Vienna aboard a wide-bodied jet. We enjoy inflight movies, dinner and breakfast aloft. Upon arrival in Vienna, we are met and transferred to the hotel. Dinner and overnight at our hotel. This morning, we drive to the Hofburg, we celebrate Mass and visit the Gothic St. Stephen's Cathedral and the 17th century Capuchin Church containing the Imperial Vaults. We continue our tour to City Hall, the Burg Theater, Houses of Parliament, two State Museums, the Opera and the Schonbrunn Castle with its vast French Park. This afternoon, we have an excursion to the historic Vienna Woods, driving past Liechtenstein Castle to the ancient Heiligenkreuz Cistercian Abbey and on to Mayerling, the former Imperial Hunting Lodge. Dinner and overnight at our hotel. Today we drive to Salzburg, ancient seat of the Archbishop and the location for the "Sound of Music." We arrive in time for city sightseeing. See the Castle of Hellbrunn, Residenz Fountain and Tower, and enjoy the unusual architecture, which lends much to the character and charm of the city. See the colorful old section with narrow streets, the Cathedral where we celebrate Mass and Mozart's birthplace before going to the hotel for dinner and overnight. This morning we leave Salzburg and travel through the Tyrol to Innsbruck. We begin our city tour in Tyrol's Olympic City of Innsbruck, we view the "Golden Roof" and Hofburg Palace. Then we visit the famous Olympic village and enjoy the beauty of this lovely city tucked deep within the Alps. We will celebrate the Vigil Mass at a local parish church and then proceed to our hotel for dinner and overnight. This morning we have a scenic drive on our way to Oberammergau. We visit the famous Neuschwanstein Castle built by Mad King Ludwig. We continue to Oberammergau. We arrive in the famous Passion Play village where we transfer to our accommodations. Following lunch on our own we can visit the Oberammergau Museum or to simply walk among the many craft shops. We then head off to the Theatre. “A play about death and life, promised at the moment of a fatal threat “– these are the opening words of the story of the Oberammergau Passion Play in 1633. In the middle of the Thirty Years War, after months of suffering and dying because of the plague, the people of Oberammergau vowed to perform "The play of the passion, death and rising of our Lord Jesus Christ" every ten years. At Whitsun 1634 they kept their promise for the first time, on a stage which they had set up in the cemetery, over the graves of those who had died of the plague. 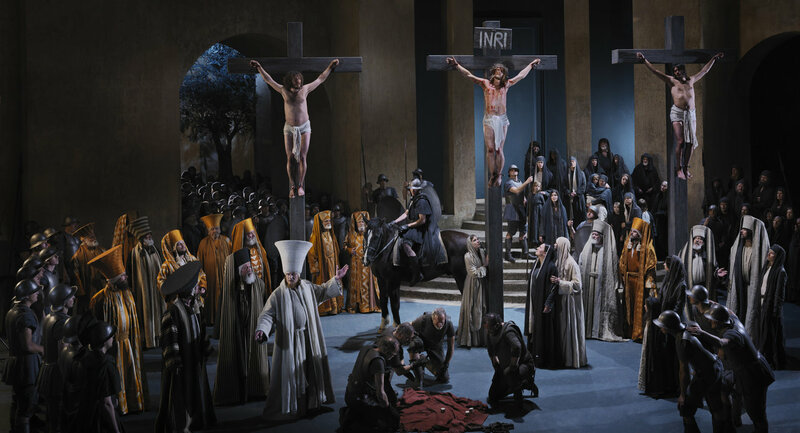 In 2020 Oberammergau will, for the 42nd time, be putting on the play that has been carried on over the centuries in a unique continuity. The play shows the story of Christ's Passion, beginning with the entry into Jerusalem and ending with the resurrection. The structure of the play is living pictures from the Old Testament and acted scenes from the New Testament. The Play employs a large choir and orchestra. Our performance runs 2:30 to 5:00 PM and after a 3-hour dinner break it concludes 8:00 to 10:30 PM. Overnight at our hotel. This morning following Mass at the local parish church we drive to Munich and meet our local guide to begin our tour through the exciting Bavarian capital. Pass the Olympic village and stadium, along the Leopoldstrasse with the Triumphal Arch and Hall of Generals; see the Theatiner Church and Residence Palace. A visit to the Nymphenburg Palace and a stop to see the famous Glockenspiel at the new Gothic City Hall complete our tour. We have the opportunity to explore the culinary delights of Munich, as dinner is on our own. Overnight at the hotel. This morning we celebrate Mass at the 'Frauenkirche', the Cathedral of Munich and enjoy another morning sightseeing. We see the Glockenspiel at Marienplatz, the Michaelskirche, and we see the Residence Palace. Afterwards we continue to Switzerland through a picture book Swiss Alpine setting, the lovely lakeside town of Lucerne. Dinner and overnight at our hotel. Today we visit Lucerne and the beautiful Lake. We see the Chapel Bridge, the Lion Monument, Hofkirche, the Musegg Towers and Weinmarket Fountain. This afternoon, we drive to nearby Engelberg Abbey, a delightful Benedictine Abbey founded in 1120. We celebrate Mass at the Abbey (if possible). Return to the hotel for dinner and overnight.